I wonder what thoughts went through the mind of the first person to stumble upon a quince? Did he or she come across the large yellow fruit hanging heavily on its branches and wonder what on earth it was? Perhaps they puzzled over its furry skin? Or that it didn’t seem particularly tasty (or possible) to bite into, that it might not even be edible? I wonder if upon deciding to cook it (and cook it and cook it), that they came to the conclusion that it was pure alchemy that made the flesh turn from a pale yellow to pink through the application of heat. My mother along with many of her Russian friends has been cooking quinces forever and she taught me how to make this paste along with various other types of quince jam. As a child I remember puzzling over the huge fuzzy fruit, too hard to eat raw, wondering what on earth my mother was going to make out of it. There would be buckets of quinces in the kitchen usually procured from neighbours who didn’t know what to do with them, and the huge orange Polish enamelware pot (which I now own) would be hauled out of the laundry to make jam (it usually only ever made an appearance for borscht or jam cooking sessions). The kitchen would be steamy and abuzz with the makings of jam and canning for at least a day, sometimes well into the night. So as winter takes it’s last breath in the southern hemisphere, it will soon be taking all the quinces with it. Whilst it is now only very early spring in Australia I am still able to find them in the local continental grocer’s shop. However it won’t be long before we’ll be needing to wait until next autumn to see them once more, to again take in their sweet perfume and beautiful rosy hue. 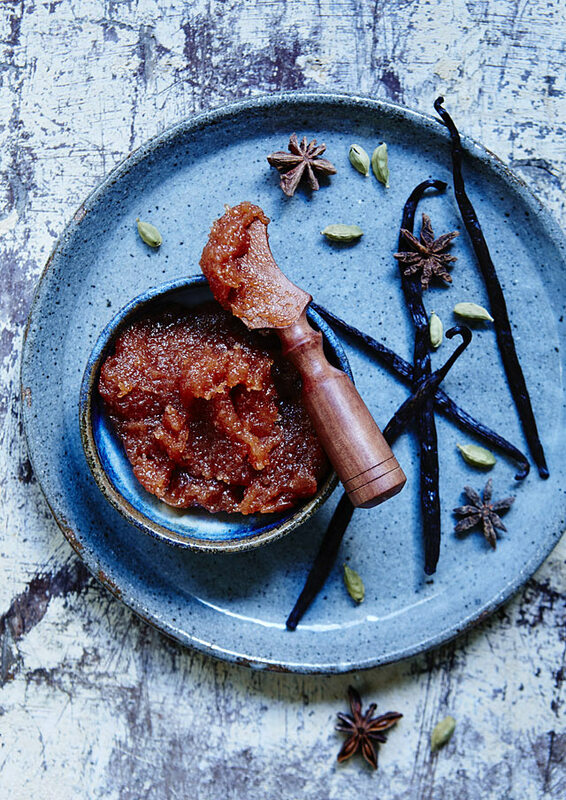 My advice would be to make a batch of this quince paste and leave it in your fridge to enjoy over summer with cheese, cold meats and very cold white wine. I know I will most certainly will be doing just this. Makes approximately 1.5 cups. Prep time: 20 mins, cooking time 2.5 hours. 1. Place the chopped quince into a heavy based saucepan over low heat with the water, vanilla bean, star anise and cardamom pods and cook for two hours stirring occasionally and checking often to make sure the fruit isn’t drying out and sticking to the base of the pan. If the fruit looks dry add small amounts of water to keep it slightly moist. 3. Cook over low heat stirring constantly until the sugar has dissolved and the purée has thickened. You will know it’s ready when it thickens and begins to come away from the bottom of the pan as you stir it. 4. Divide paste evenly into ramekins, cover in cling wrap and refrigerate when cool to set. The paste will set overnight. The focus of the image had to be the beautiful colour of the quince paste so I chose very cold-coloured props to go with it. The stoneware bowl and plate are from local op-shops as is the little vintage wooden paté knife. The background is an old weathered piece of masonite I found in hard rubbish on my street. The only other props the paste needed were the spices which went into it. K.I.S.S. (keep it simple stupid) is very much my motto these days when it comes to photography and food styling. (Leave the fussy propping to the amateurs most professional stylists say.) The only light used in this image is window light. I have vanilla bean paste – could that be used instead of the whole bean? Hi Tanya. I made this yesterday and, despite my freaking out thinking it wasn’t working, it turned out beautifully. Any suggestions on how to get the sieve (that got a slightly broken but fixable handle in the process) clean after? Great recipe!